Did you go Christmas caroling as a kid? These toilet paper roll carolers remind me of traipsing through the neighborhood to sing to anyone who would listen. I hope these toilet paper roll carolers (or paper tube carolers) bring a smile to your face, like they do mine! Of course, you *could* save up toilet paper rolls until you have enough for a caroling group. 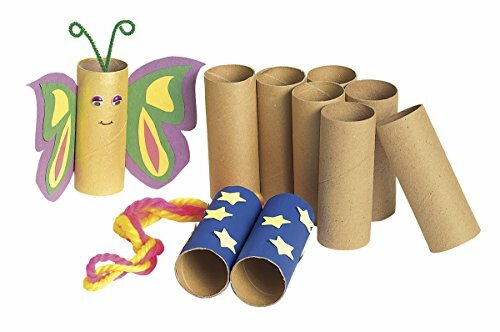 Or, you could make your life easier and just order these craft paper tubes! Paint the top ⅓ of the toilet paper tube a flesh tone. Allow to dry completely. Cut strips of felt wide enough to wrap around the tube and just tall enough to cover the top ⅓ of the toilet paper tube. Cut the felt into the shape of hair. See photo. Glue the hair around the top of the toilet paper tube. Cut a colorful piece of felt wide enough to wrap around the tube and about 3 ½ inches tall. Fold up ½ inch of felt and glue in place. Refer to the photo. Glue the hat on top of the hair and around the top of the tube. Use a needle and thread to weave through the felt. Once through all the felt, cut the thread off leaving enough to tie. Pull tight until the felt bunches together and then tie in place. Refer to photo. Use scissors to fringe the top of the hat. You can also cut off the excess felt and glue a fuzzy pom pom on top. Cut a piece of felt wide enough to wrap around the tube and tall enough to cover the bottom ⅔ of the tube. Glue the felt onto the tube. Tie the felt around the tube and glue off to the side. Refer to the photo. Cut 2 mitten shapes from felt. Cut a small song book from white cardstock. Fold in half. Glue the mittens onto the toilet paper tube. Refer to the photo. Remember to just glue the end, not the entire mitten down. You need them to flap so that you can glue them to the song book. Glue the mittens onto the song book. Use paint pens to draw a note onto the song book. Use paint pens to give the toilet paper tube a face. Use your finger to dab the pink paint to give it a more natural look. Your caroler is finished and ready to sing!